Herzog, "Man on Wire" and "Trouble the Water" make Academy shortlist, but "Order of Myths," "Unforeseen," "Roman Polanski" and "Gonzo" are out. 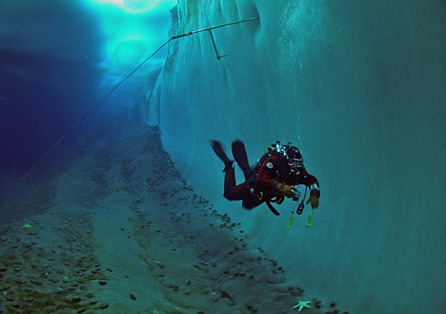 A diver under the ice in "Encounters at the End of the World." Things are a little quiet this week atop Beyond the Multiplex towers, here on the campus of Salon University. So I thought this blog could get a little late-autumn shuteye as cold weather settles in and I work on some longer-term projects. Then out comes the announcement of this year's Academy Awards shortlist in the Documentary Feature category (which winnows the 94 eligible films down to 15 semifinalists), and it's time to wake the sleeping hamsters under my computer and put them to work. More thoughts anon, but we're basically talking about the same old docu-Oscar problem: It might be a marginally stronger list than last year's, but there's still way too much cinematically dubious spinach, and too many excellent films got left behind. In good news, Werner Herzog's "Encounters at the End of the World," James Marsh's "Man on Wire" and Carl Deal and Tia Lessin's "Trouble the Water" (everybody's odds-on fave to take the prize) remain in the running. In double-plus-ungood news, Margaret Brown's wonderfully nuanced and profoundly personal film about the racially segregated Mardi Gras traditions of Mobile, Ala., "The Order of Myths," was left off, as was Laura Dunn's gorgeous "The Unforeseen," which I've described as the "Chinatown" of Texas real-estate documentaries. Those were two of the best examples of American filmmaking to be seen on screen all year, and the fact that they're high-integrity regional films made far from the coasts makes the whole thing even worse. It's a complete and total goddamn travesty, is what it is. Oh, and when I get back around to this issue, I'll let you know what I really think. Marina Zenovich's "Roman Polanski: Wanted and Desired," which attracted raves at both Sundance and Cannes and then aired on HBO, is another surprise omission. Alex Gibney's Hunter S. Thompson doc "Gonzo" would have been a strong contender in nearly any other year, but Gibney got his surprise statuette last February for "Taxi to the Dark Side," and has nothing to complain about. It's unfair to criticize films I haven't seen yet, so it's hard to generalize about the list as a whole. There does, however, seem to be some of that Hollywood yearning to reward earnest social-issue filmmaking in operation here, with pictures like "They Killed Sister Dorothy," "At the Death House Door," "The Garden" (about a community garden in post-Rodney King Los Angeles) and "Blessed Is the Match" (about a Hungarian poet who died trying to save Jews from the Nazis). Patrick Creadon's "I.O.U.S.A.," an explainer about the national and societal crisis presented by widespread American debt, benefited from what you might call perfect market timing (and has also been enthusiastically reviewed). There are a couple of big surprises, none bigger than the inclusion of "The Betrayal (Nerakhoon)," a slow, lyrical and haunting family epic from longtime cinematographer Ellen Kuras that stretches from rural Laos to New York. (It opens this Friday and I hope to post a review by then.) Stacy Peralta's accusatory history of South Central L.A.'s gang war, "Made in America," struck me as an unfinished but potentially great film when I saw it at Sundance -- but it still doesn't have a distributor. The composer biopic "Glass: A Portrait of Philip in Twelve Parts" is also an unexpected choice -- or it would be if director Scott Hicks hadn't previously been nominated for a narrative feature ("Shine"). Anyway, more to come. We've got the entire holiday season to chew on morsels like these. Your thoughts?